Tavis and I have traveled all over the place, but there's something so amazing about Maui. It's perfect year round weather, luscious green terrain, lovely warm blue water, great snorkeling, the island is clean and kept up well, there's a nonstop flight from Seattle which is convenient. AND The kids LOVED it. Our daily schedule consisted of 1) watching Moana 2) beach 3) lunch and naps 4) beach again 5) sunset + dinner. A Hawaiian vacation is expensive no doubt, but I felt determined to not make it any more than it had to be. We didn't break the bank, didn't have any post-vacation overspending regrets.... but we still had SO much fun. Watch this video.... doesn't it look fun!? 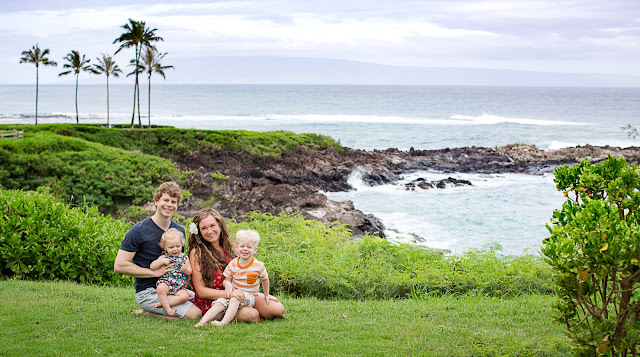 One week in Maui for a family of 4 for $2000. Use a credit card with travel perks. Essentially, all of our flights felt "free" because we used miles. Our card also has a $350/year "travel allowance" which we used on our rental car... also felt "free" - We flew Hawaiian Airlines... highly recommend. They give a complimentary meal on each flight too! Spend *almost* the same amount of money on food as you would at home. To do this, we had to eat every single meal at our condo. (excluding Starbucks... and we got a few treats that we all shared) For some, not eating out might take away from the vacation experience.... but I just bought some tropical island food at the store instead :) There's a costco right by the airport. The fruit generally is WAY more expensive than here, but they have those deli dinners which are very reasonably priced and yummy. Don't buy any souvenirs. I'm not going to lie, when I walked past all the hawaiian attire at Costco I was tempted to get a cute new dress, but realized we didn't NEED anything. So my desire to save money outweighed my desire for new Hawaii wear, haha. If you DO want souvenirs, buy them at the Walmart by the airport for cheap. Don't pay for parking. There are a few paid parking for the beaches but you can usually find free parking nearby. Don't pay full price. If you do decide to book an excursion or activity never pay full price... there is an online coupon for everything. Use the Yelp app to help you save: Example: The main tourist areas have restaurants for $20 min. per person.... if you look on yelp you can find hole in the walls for more like $10 a person, etc. Also, not this trip but on a different one we skipped the $200 hotel spa massages and got $30 massages at the Ahola Message School or something... totally worth it! !